Last summer my friend invited my scrapbook friends and I to her cabin for a scrapbook retreat. We of course took full advantage of this opportunity and enjoyed ourselves thoroughly. We all took pictures to scrap of our retreat and I was saying how we needed a cabin die cut for our layouts, but none of us knew of any. So the minute I saw this CottageCutz Camping release I knew exactly which die was at the top of my list! 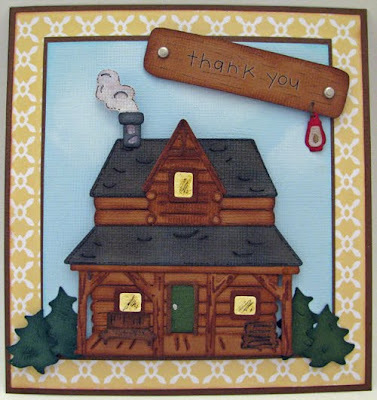 This Cottage Cutz Lodge is perfect for my retreat pages and of course a Thank you card for my friend for letting us come and stay. This card will get set aside for our next retreat and I can't wait till we get to go again. The snow just needs to melt first!!! I used my Copic markers as well as my Ranger Distress Ink. I sponged a little of my white Dew Drop on the light blue for some clouds. I made my own "Thank you" log to put my sentiment on and then punched a tiny hole so I could hang my tiny lantern from a jump ring. I love this, Kay!! The copics add such amazing details! This will be so perfect!! Your lodge is amazing! Cute card!!!! That is really a awesome card! The details on it are great!